Apple CEO Tim Cook accepted marketing chief Phil Schiller's call to undertake the "ice bucket challenge" to raise awareness and money for the ALS Association, an activity that quickly gained steam in the U.S. thanks to social media. After completing the challenge himself on Wednesday, Schiller tagged Cook in a Twitter post calling for the Apple CEO to also get doused. 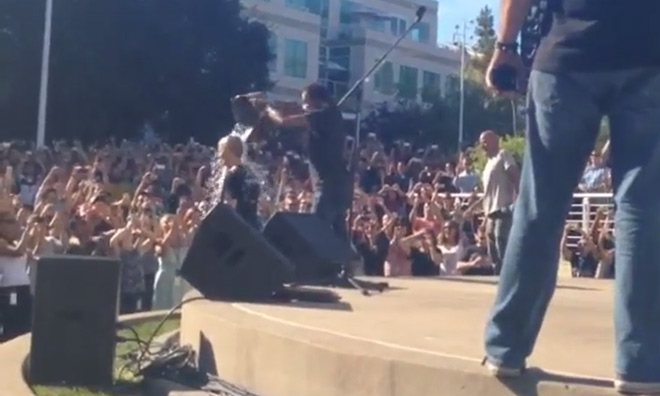 As seen in the screenshot above, taken from a now-removed video by Instagram user "paige_staple," Cook was soaked with a bucket of ice water by musician Michael Franti during a Beer Bash at Apple's Cupertino Campus on Thursday. Cook subsequently challenged Disney CEO Bob Iger, Beats' Dr. Dre and Franti to take the plunge. The ALS Association kicked off the ice bucket challenge on July 29 and has since seen millions of dollars pour in as company CEOs, celebrities, athletes and the general public joined in the festivities. The wildly popular activity has helped ALSA raise $7.6 million in donations, up from $1.4 million taken in during the same July 29 to Aug. 14 period last year. According to the "rules," those challenged have 24 hours to either take an ice bath, donate to the charity or, as many people are doing, both. Anyone can take part in the fun and donations are being accepted through the official ALSA website.